A course to help you learn real English. In this episode of Undercover English, Sian is going undercover to buy lunch in a cafe in London. 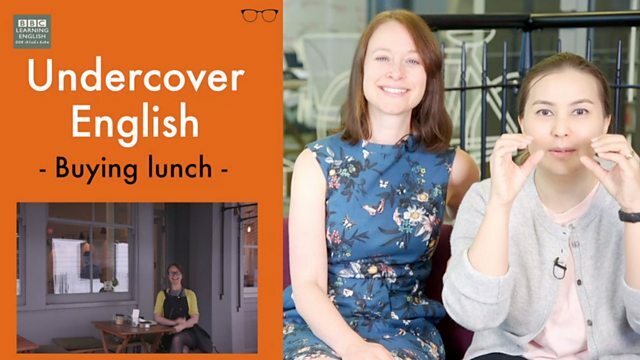 Join Sian and Clare to find out how you can order food in a cafe in the UK and to learn real, spoken English. Why doesn't Sian have quiche for lunch? 1) When you go into a cafe, what does the assistant say to you? Hello, what can I get you? * They are welcoming you to the cafe and asking you to give your order. They don't want to know all about your health! 2) What does the assistant say when what you want to order is no longer available? 3) How does the assistant ask if you want to have your food in the cafe or to take away? Choose the correct answer to these questions. Do they really want to know how you are feeling? If the assistant in a cafe asks you 'how are you doing?' when you enter, how are they expecting you to reply? What phrase can you use when a cafe sells all of something and there is nothing left. I'm sorry but we've ______ chocolate cake. We hope to have more tomorrow. They are asking if you want to order anything more to eat or drink? Join us on our Facebook, Instagram and YouTube pages for more fun with English! Join us for our next episode of Undercover English to find out more about how English is really spoken! To have here or to take away?